First, we advertise the Rose Queen Festival in Littlebeck on Tuesday 7th August in the afternoon (although help is needed all day!). Then a story about Kate Gordon (see last Monday’s Staithes blog) and another story about Brazil will be added later (it’s there now!). We can now reveal that Kate Gordon, the visitor who came to Staithes first day and to Littlebeck, has been formally appointed as UK Men’s Shed Association to the role of Shed development. Kate expressed her thanks in an email yesterday because her visits gave her a real understanding of some of the “human” elements of what Sheds are. Kate is in the early stages of establishing a community project of her own (and of her grandmother!) called Ruby’s Yard. It is a canalside location so let your mind wander over possibilities for that project! There is a real happenstance story behind Kate. 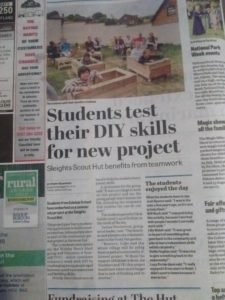 Originally Graham was asked by UKMSA to speak to her about the community project with Eskdale School, Whitby Scouts and Volunteer It Yourself. That was one week before Graham vanished to Oz. On his return an email arrived from Kate on the morning of the community project requesting a conversation. We spoke that lunchtime and Kate revealed she had researched Men’s Sheds and seen a post advertised. She applied and was to be interviewed the very next day. You can join the dots from what you already know. Amazing what happens when you go away:-). Graham has had a longstanding friendship with a Brazilian. A little bit father and son like. Indeed, like a son, Celson (his name) will often argue with Dad! Dad argues back and TOGETHER they arrive at better solutions to ideas by testing each other:-). Celson is a professor at a university up the Amazon in Santarem. Graham has visited him there. Celson grew up in Santarem, studied and worked in Europe (France and Portugal) which is how Graham met him in research projects they collaborated on. A real bond was established, now supported by Skype. One of Celson’s passions is to help young people, just like he once was, to dream higher! 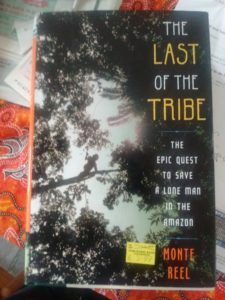 He has engaged in projects with Amazonian indigenous tribes for instance, but also primary (junior) education. He set up projects in what is called the Maker Movement (a global push) based on the fact that kids learn better by doing and discovering for themselves from each other. Maybe you see how this fits with Graham’s passion for Men’s Sheds and work like that reported in the item above. On the Internet news last week there was a report of a sole surviving Indian to the west of Brazil last seen more than 20 years ago. There was footage of him taken at a distance axing a tree. His 5 friends had been killed by loggers. Graham forwarded the article to Celson and it also featured on Saturday on the Today programme. Now for the uncanny, spooky bit. On Friday afternoon Graham welcomed visitors to his cottage. He did the usual tour of explanation and stopped in front of a bookcase/dresser. He noticed a book resting across the top of other books and he began to put it in place upright. Then he noticed the title (see below) It was a book published last century about the very same man!!! (he’s photographed on the cover axing a branch). Where had this book come from? It was not Graham’s stock. He is in the process of contacting earlier guests to find out who donated the book. It is a quite incredible coincidence.